The House Appropriations Committee (HAC) passed its version of the Fiscal Year 2015 defense appropriations bill which limits the number of Ticonderoga class cruisers the Navy can lay up as well as includes funds for long lead items for the midlife refueling of carrier USS George Washington (CVN-73), according to a version of the bill released on Tuesday. The bill also funds half of the Navy’s unfunded request for additional EA-18G Growler electronic attack aircraft. 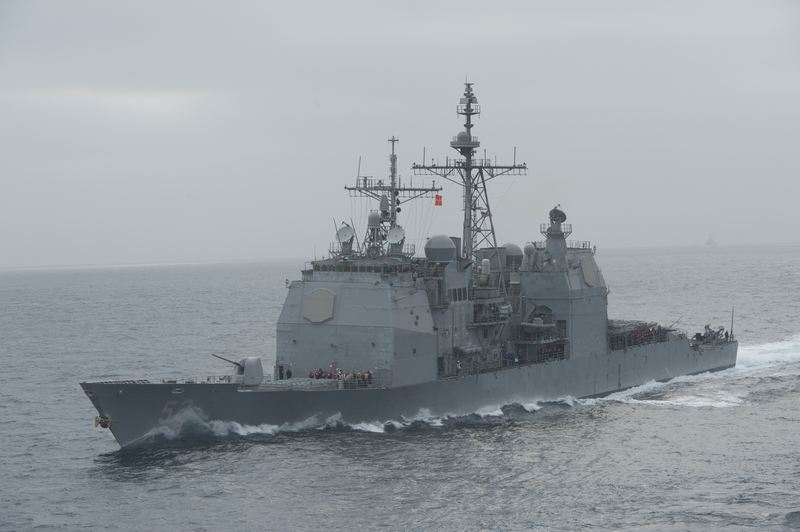 According to the report of the bill, the HAC “was disappointed” with the Navy’s plan to lay up of 11 Ticonderogas in anticipation of future upgrades in a plan the service devised after repeated attempts to decommission the older Aegis warships. “The Committee is concerned that this long term lay up will lead to decommissioning of some or all of these cruisers in the near future,” read the report. Toward the effort, the committee included $540 million in the service’s modernization fund. The HAC also included $789.3 million in long-lead procurement for the more than $3 billion, four-year long refueling and complex overhaul (RCOH) of George Washington. Secretary of Defense Chuck Hagel announced in February the Pentagon would decommission George Washington instead of refueling the carrier if the sequestration spending limits as part of the Budget Control Act of 2011. “While the Secretary of the Navy explained this as a cost saving measure and a deferral of the actual refueling decision, the Committee believes it to be a shortsighted position since the Congress has already appropriated in excess of $500 million towards the effort,” read the report. The Navy had included $796 million for the RCOH in a draft version of its unfunded requirements list that was leaked to Congress. The final version of the list — approved by Chief of Naval Operations Adm. Jonathan Greenert — omitted the funding. The bill also funded 12 Growlers for $1.018 billion — half of the Navy’s unfunded request. The measure also funds nine P-8A Poseidon multi-mission aircraft — one more than the budget request — for $2.12 billion and six new ships, two Virginia-class attack submarines (SSN-774), two Arleigh Burke destroyers (DDG-51) and two Littoral Combat Ships. “In total, the bill provides $491 billion in discretionary funding, an increase of $4.1 billion above the fiscal year 2014 enacted level and $200 million above the President’s request. In addition, the bill includes $79.4 billion in Overseas Contingency Operations (OCO) for the ongoing war efforts abroad, the same level assumed in the President’s budget request and in the House-passed National Defense Authorization Act,” according to a release from the HAC. The final version of the bill could go before the complete House as early as next week.